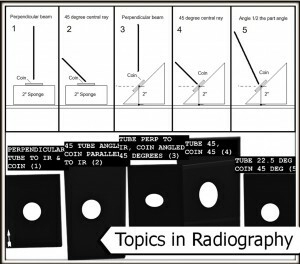 A while back I discovered Jeremy Enfinger and his amazing website “Topics in Radiography: News and Tips in the World of X-Ray” (http://topicsinradiography.com/). Today I’m going to have Jeremy be my guest writer as I post one of my favorite blogs of his – Shape Distortion. One of the most fun courses I have taken and taught is exposure principles. 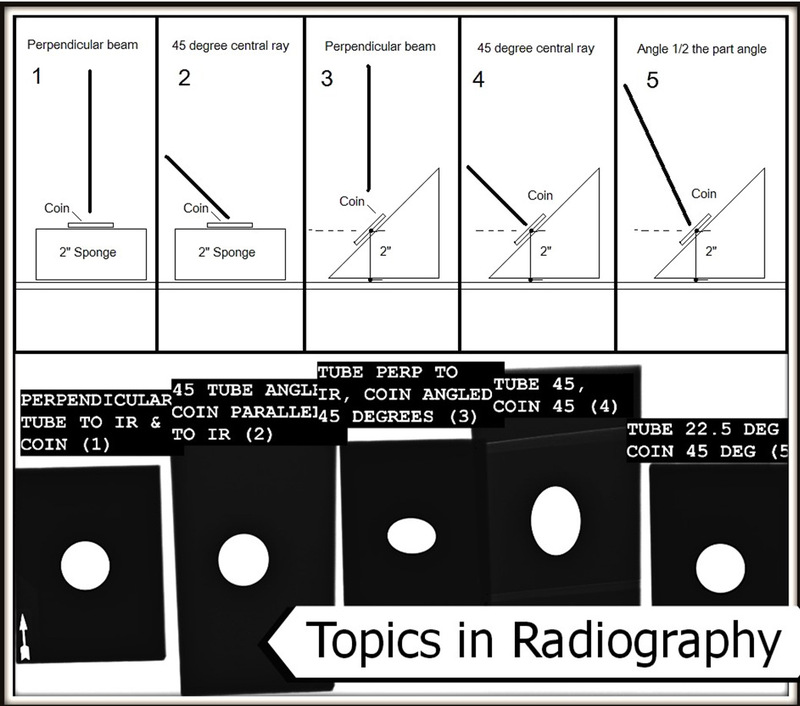 This course typically introduces students to different types of distortion that can occur on the radiograph. Size distortion, otherwise known as simple distortion or magnification, occurs when OID is increased. The other type of distortion, shape distortion, can be broken down into two main categories; foreshortening and elongation. 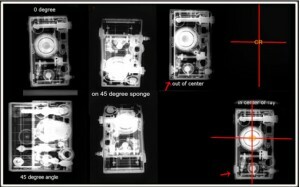 Foreshortening is when the radiographic image measures shorter in one dimension than the actual object being radiographed. The only way this can happen is if the central ray and image receptor are perpendicular, and the object being radiographed is angled. This is demonstrated in the image below (courtesy of students in the Radiography Program at OCTS/KCTCS) by comparing the top left, undistorted image, to the middle two which were placed on 45 degree-angled sponges. This may also result in unequal magnification, where one side of the object may appear larger than the other due to differences in OID from one end of the angled part to the other. Elongation is when the radiographic image appears longer than the object being radiographed. There are several situations where this can happen. If the central ray is perpendicular to the part, but the IR is angled, there will be more elongation with a greater increase in IR angle. If the part is parallel to the IR, but the x-ray tube is angled, elongation can occur as in the bottom left image below (45 degree tube angle to the part). 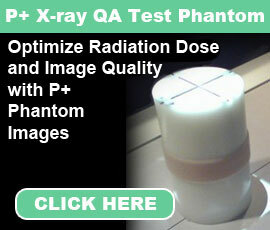 Elongation can also occur when the x-ray tube is off-center to the part, even though the part may be parallel to the IR. This is caused by the divergence of the beam, and is demonstrated by the two images on the right below. *note – there would be no difference between an off-centered x-ray tube with collimation opened to the part compared to a tube angle from the same starting point (as long as the tube does not move). You’ll notice very slight elongation in image 2 compared to the first. Image 3 is quite foreshortened, and image 4 has the most elongation. Image 5 is very useful for trauma views, and is illustrated with exams like the axial calcaneous and AP sacrum/coccyx. The tube is angled half of the part’s angle to the IR. This reduces the effects of elongation as much as possible, so our exposure 5 measures the same as exposure 1.